The stones show the point on the horizon where the sun rises on the vernal blot. 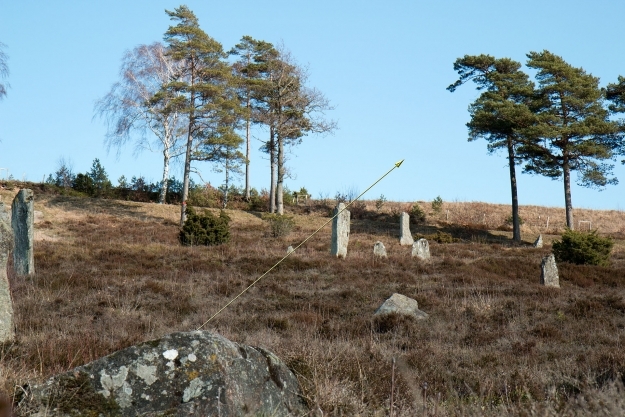 The distance between the stones is 54 m.
The animation shows the vernal blot based on the spring equinox as defined by 1) Height Model Equinox and 2) Refraction Equinox. See definitions in Days-of-the-calendar. The sun’s path is exactly right a half moon cycle after the spring equinox, defined as the day before spring equinox according to today’s definition (“refraction equinox”). The sunrise on the vernal blot can be seen today. The next date on which this will occur is April 2-3 2015, 8:00.